It looks like thursday posts are becoming a habit. So thursday it is. 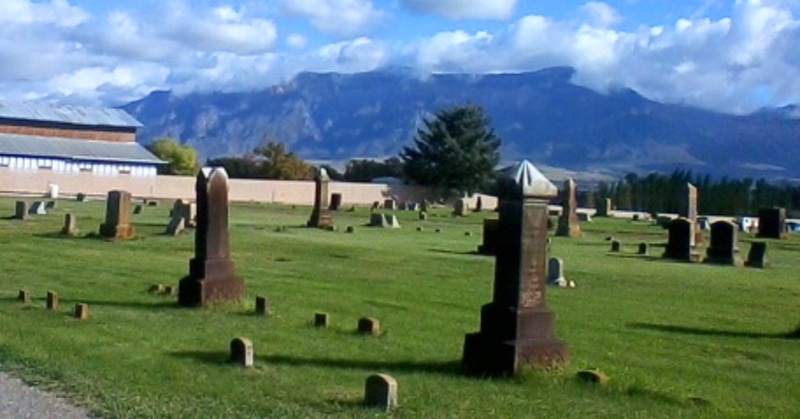 I found the West Weber cemetery while driving the back roads in Weber County. It is in a small farm town located West of Ogden, Utah on the plains between the mountains and the north end of the Great Salt Lake. As I got closer to the cemetery itself, I noticed that most of the tombstones, even the newer ones, are a deep rust color. 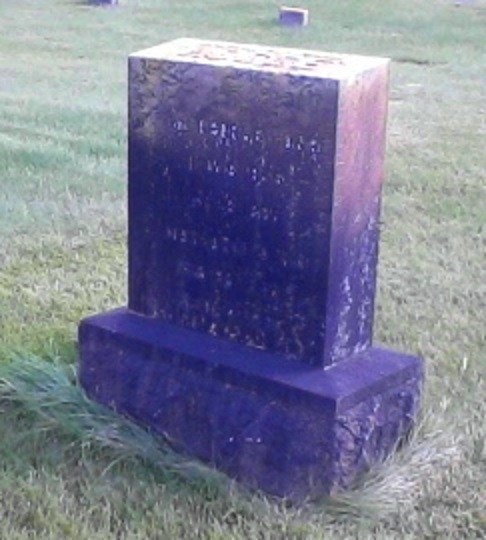 The newer tombstones are a lighter red, while the older ones are almost brownish-black. While it’s a bit disappointing to see the tombstones covered in a reddish-film, it’s also pretty cool. The dark color of the tombstones make it difficult to get a decent photograph for identifying people buried there, but the dark red color adds a mystique that can even be called “creepy” at Halloween time. However, the secret of this graveyard is not in the discolored graves. There are no trees in the cemeteries in this area. Utah is the second driest state in the nation, and unless you are very close to, or in, the mountains, you won’t find a whole lot of precipitation here. Most of the trees in this area are found along streams and rivers, or are planted by residents. But the secret of this cemetery is not in its lack of trees either. In fact, the secret of the red cemetery of West Weber is not even in the colors of the graves. I think there is a natural cause to the discolored graves: iron in the water that the cemetery is watered with. The secret of this graveyard is in its location. In the distance, up against the mountains, is the old city of Ogden, Utah. In its glory days, it was the wildest city in Utah; a wild city in the Wild West. West Weber is several miles west of Ogden, far enough that the residents here can feel a sense of anonymity, and maybe even safety, from Ogden’s disorder. It’s a great place to go if you’d like to be forgotten. And that is the cemetery’s secret. I was told the secret by the cemetery’s caretaker. On the day that I spoke with him, he was getting ready to dig a new grave in a neighboring town. I guess he knows a lot about the cemeteries in the area. He told me that he services three of them, and really loves his job. There is a story hidden so well in this cemetery, that even if you are looking for it, you will never find it. It is an unmarked grave. The story could have taken place ten years ago, or a hundred years ago. I don’t know. But I don’t think the residents of West Weber know either. The unmarked grave is that of a man who murdered several people in the Ogden area. He was tried, found guilty, and put to death. 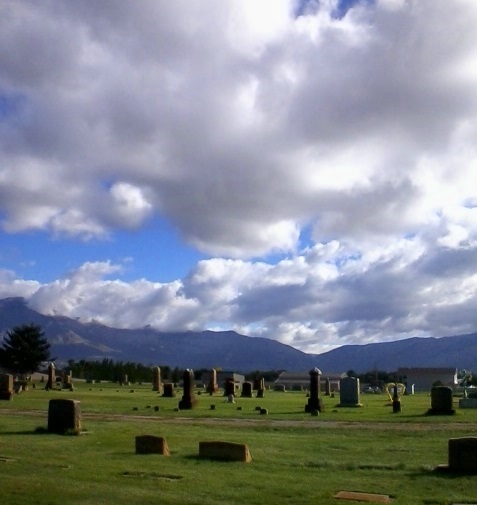 But his crimes were so heinous that no cemetery in Ogden would allow his remains to be interred with them. A deal was struck with the city of West Weber (perhaps money changed hands), and the body was brought west to this little town and laid to rest with no tombstone marking its existence. I don’t know if the story is true, but combined with the time of year, the discolored graves, and a mysterious story, you might find this graveyard a creepy place to be on Halloween night. I don’t think it is creepy; I definitely think it’s cool!